The next morning I hesitated before throwing open my window shade. In Brussels the last several days it had been cold, gloomy, and raining. Moreover, during my most recent bike trips in Europe it had rained every day. 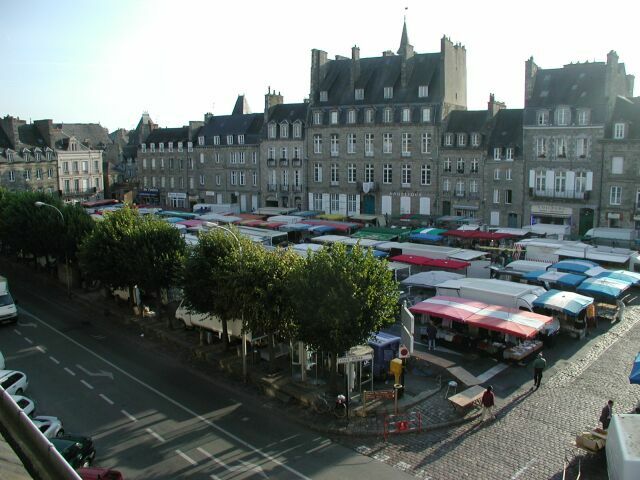 But what a glorious sight it was out my window that morning in Dinan! The sky was crystal blue, the colors were vibrant, and not a cloud in sight. Below me on the big square the weekly market was being set up. The place bustled with activity. Sometime today our bikes were going to be delivered to our hotel -- or so the bike shop had promised. But we had no idea just when, or where they were coming from. (Later we heard that they came from somewhere in Burgundy.) 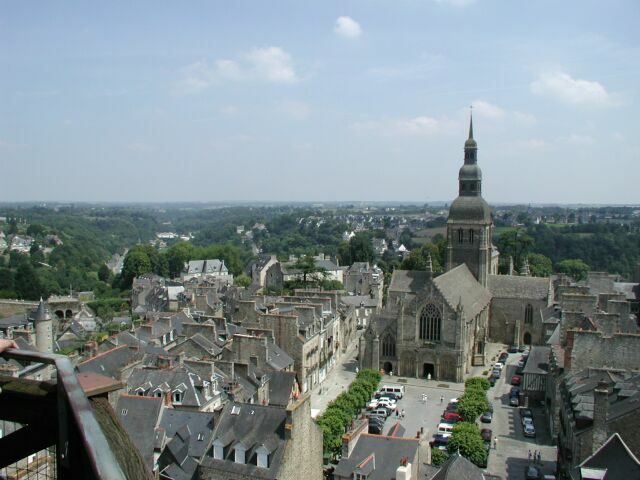 With this uncertainty, we had planned to spend the day in Dinan at leisure. 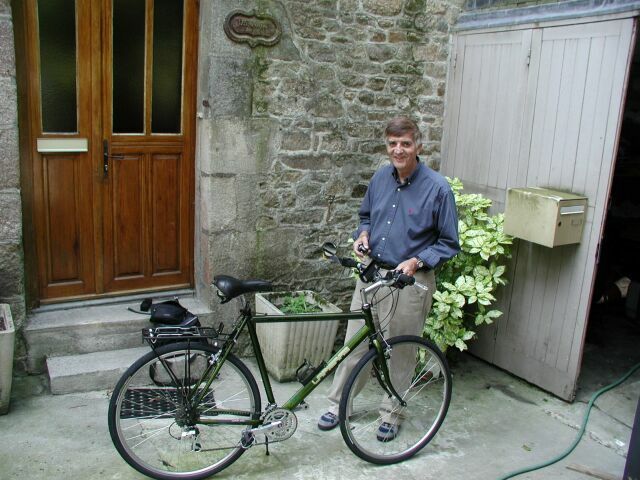 We would play tourist, equip our bikes, and then head out on the road the following morning. After breakfast we consulted with the desk clerk about the arrival of the bikes, and I was pleased to hear that the bike shop had already called for directions to the hotel. The bikes would arrive sometime later that morning. So Len and I hung around the entrance to the hotel, wanting to be sure that we were there to check that the right equipment had been included. At about 10:30am a truck pulled up at the front of the hotel and double-parked in the busy market area. The driver jumped out, opened the back and pulled out two bikes. Immediately we could see a problem; the bikes were equipped with handlebar bags, which we had specifically asked not to have. We had our own handlebar bags, and there wasn't any way we could deal with a second set of bags. Moreover, one of the bikes had no pump or repair kit, and the panniers were considerably smaller than we had been promised. We tried to point out the discrepancies to the driver, but he spoke no English and was in a big hurry to leave because of his precarious parking position blocking traffic. So with a Gallic shrug of his shoulders, he drove off to wherever, leaving us to sort things out. We took the two bikes down a back alley behind the hotel and undid the mounts for the handlebar bags, then mounted our own bags and added the mounts for our GPS receivers. On the good side, the bikes themselves seemed fine. Here I am, looking over mine. There is a special feeling about getting acquainted with a new bike that will be your traveling companion for the next week or so. At first it is a stranger, but by the end of a trip, I always feel that it has been my trusted friend, and I hate to part with it. Here I have just removed the handlebar mount and installed my own rear view mirror. We decided to leave the original handlebar bags with the desk clerk, not to worry about having only one pump and repair kit, and to make do with the small panniers. Actually, we didn't have much choice. Later we discovered that for each us our baggage was a tight, but possible fit, into the panniers. Having finished preparing the bikes, we wandered through the market. Len found a pair of sunglasses and tried to bargain with the merchant. That didn't work, however, and he ended up paying the asking price, which seemed rather fair anyway. Then we walked up the street. I was looking in the store windows or something like that, and not paying a lot of attention to the sidewalk. But Len was. Three girls had just run into a friend, another girl, and the friend was kissing each of the others in turn. Len jumped into the line at the end, and before I knew what was happening, Len was getting a nice kiss from a very surprised girl. Her look said, "What did you come from?" We bought a detailed map for the next day's ride at a newspaper shop. The map had exactly the area between Dinan and St. Malo, where we were headed. I thought that this would be easy in the future, and that each day we could buy the next day's map, but it never quite worked out that way. The maps never coincided with where you were headed, so that a day's ride might require 3 or 4 maps, which was too inconvenient and expensive to consider. Armed with the precious map, we headed down an attractive side street. 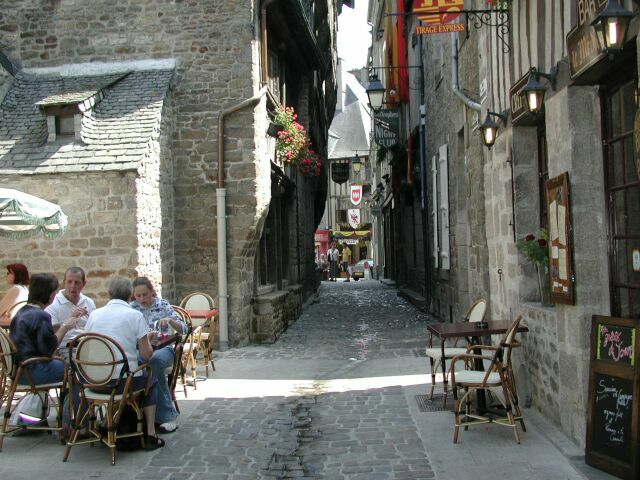 I loved the narrow cobblestone streets where adjacent buildings almost touched. Some of the half-timbered buildings reminded me of English towns that I have visited. We found a clock tower, where for an admission fee you could climb to a nice view of the city. Here is one of the pictures that I took from the tower. In this view I was interested in seeing the river on the left, because we would bike along that river north to St. Malo the next day. We had lunch at an outdoor cafe. There were many such cafes and they were all crowded, perhaps because it was market day. I had a delicious ham sandwich on a baguette with a coke. Nothing like French bread -- it would be one of the joys of biking here in France. After lunch I walked with Len into a business part of town to an SFR telephone store to try to resolve a problem that Len had discovered with his cell phone. He had bought the GSM phone in Belgium with a prepaid card so that he could make and receive calls from the US. It worked fine in Belgium, but wouldn't work in France. Apparently, the different telephone companies didn't cooperate on their calling plans. We spent a forgettable half-hour in the SFR store, acting out something like a Monty Python skit with a salesgirl who didn't speak English. My poor French wasn't up to it, and the telephone thing was complicated. It seemed that we could buy a new prepaid card, but it wouldn't be activated for three days. We gesticulated back and forth. She spoke French and we spoke English. Finally, we gave up. It was hopeless. Len consoled himself with the thought that he at least could receive incoming calls. We walked outside the city walls for a ways, then back inside the walls and down one of the steep streets that led to the river below. The street, as you can see, was lined with galleries. As I walked I was thinking that the next day I would have to bike up a hill exactly like this a little further along the river. I had learned that from the detailed map that we had gotten that morning, which had elevation markings. 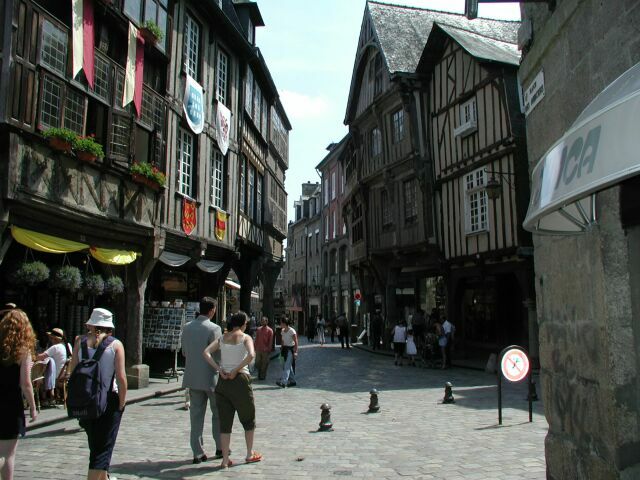 At the bottom of this street there was a beautiful panoramic scene formed by the river, a small bridge, pleasure boats, and the steep hill and city walls of Dinan. We bought some bottled water at a bar along the river. We didn't actually want the water, but we needed some water bottles for our bikes. After we had left the phone store a little earlier we had stopped in a bike shop looking for some "official" water bottles. They only carried one type of water bottle, and it was a rather ugly red with a Coca-cola logo. When we had turned to leave the store, a salesman had caught up with us out in the street. I had thought that he was going to try to sell us some other water bottle, but instead he lectured us on French etiquette. "When you come into a store in France, you must say 'bonjour'," he admonished us. Anyway, now we were equipped with clear plastic, cheap water bottles. And we had some water too. The irony of the water bottle thing was that later in our trip we watched the Tour de France on television, and there was Lance Armstrong, drinking out of the exact type of water bottle that we had rejected in the bike store. 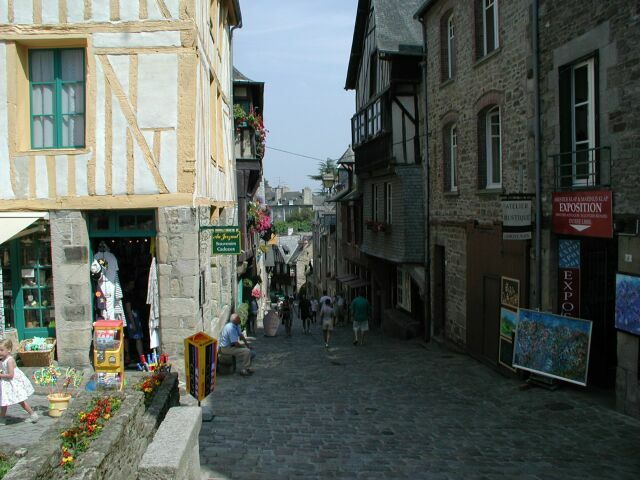 We trudged back up the steep hill and across the city walls of Dinan back to our hotel. A little later we went in search of a restaurant. It was till relatively early for a restaurant there -- only 7:30pm -- and for a while we were the only patrons in a restaurant called Canterbery. Afterwards there wasn't much to do. We missed the Irish pubs that we had frequented in the previous year's trip. But tonight we retired early, looking forward to beginning the biking on the morrow.